These Hoods are made to fit over the multiple 4" dust ports on our Wide-Belt Sanders. Each base has a 1-1/2" flange on all sides for mounting to the sander. 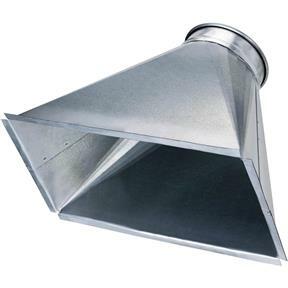 Ports have rolled ends that connect to similarly sized pipe and fittings.Fits: H2934, G0447Base: 11" x 22"Port: 10"Height: 22"
These Hoods are made to fit over the multiple 4" dust ports on our Wide-Belt Sanders. Each base has a 1-1/2" flange on all sides for mounting to the sander. Ports have rolled ends that connect to similarly sized pipe and fittings.